ინდოირანული ანუ არიული ენები— წარმოადგენს ინდოევროპული ენების ოჯახის, აღმოსავლეთის, ჩვენამდე მოღწეულ ყველაზე დიდ შტოს. ენათა ამ ოჯახს ჰყავს მილიარდზე მეტი მოსაუბრე და მისი გავლენის ტერიტორია გადაჭიმულია კავკასიიდან (ოსური) და ბალკანეთიდან (ბოშური ენა) აღმოსავლეთით სინძიანამდე (სარიქოლი) და ასამამდე (ასამური), ხოლო სამხრეთით მალდივებამდე (მალდივური). ოჯახის ყველა ენის საერთო წინაპრად მიჩნეულია პროტო-ინდოირანული ენა (აგრეთვე ცნობილი როგორც არიული ენა), რომელზეც ინდოირანელები ძვ.წ მე-3 ათასწლეულის ბოლოს საუბრობდნენ. თანამედროვე ინდოირანული ენები სამ ჯგუფად იყოფა, ესენია: ინდოარიული, ირანული და ნურისტანული ენების ოჯახები. ზოგიერთ შემთხვევაში, დარდიული ენები წარმოჩენილია როგორც ოჯახის მეოთხე დამოუკიდებელი ჯგუფი. თუმცაღა თანამედროვე კვლევების უმრავლესობა, დარდიული ენების ჯგუფს, ინდოარიული ენების ოჯახის, არქაულ წევრად მიიჩნევს. ↑ Numeral Types and Changes Worldwide, by Jadranka (EDT) Gvozdanovic, Language Arts & Disciplines,1999, Page 221. Books.google.com. წაკითხვის თარიღი: 2013-01-02. ↑ Jain, Danesh; Cardona, George, რედ-ები. (2007). 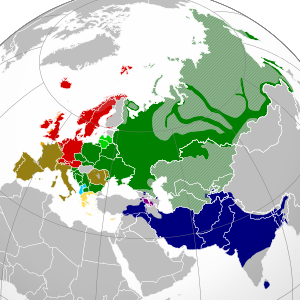 „The Indo-Aryan languages“. The Indo-Aryan languages. p. 905. ISBN 978-0415772945. "'Dardic' is a geographic cover term for those Northwest Indo-Aryan languages which [..] developed new characteristics different from the IA languages of the Indo-Gangetic plain. Although the Dardic and Nuristani (previously 'Kafiri') languages were formerly grouped together, Morgenstierne (1965) has established that the Dardic languages are Indo-Aryan, and that the Nuristani languages constitute a separate subgroup of Indo-Iranian.". ეს გვერდი ბოლოს დარედაქტირდა: 09:43, 7 ივლისი 2018.